There is nothing ordinary about the train journey from New Jalpaiguri to Darjeeling simply because the Toy Train is no ordinary train. On December 1, 1999, UNESCO declared the Darjeeling Himalayan Railway  as this train is called  a world heritage train. Surabhi Khosla captures the enchantment of a unique experience. ITS a journey into the clouds. As you hurtle past tea gardens, sunny villages and little mountain streams, most of the scenes look frozen in a picture postcard. The journey from New Jalpaiguri (NJP) to Darjeeling is no ordinary train travel simply because the Toy Train is no ordinary train. Not any more. On December 1, 1999, UNESCO declared the Darjeeling Himalayan Railway  as this train is called  a world heritage train. This is the first train in Asia and the second in the world to have been declared heritage property. The first was the Semmering Railway in Austria glimpses of which were seen in the movie Sound of Music. 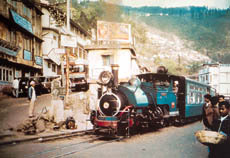 Set up in 1881, the Toy Train contributed to the strategic communication plans of 19th century India and the position of Darjeeling as in an important garrison town and political centre in summer. Over the years, however, Darjeeling became known all over the world as an exotic hill station which produced some of the best quality tea. Interestingly, most foreigners who come to this area visitors know and love the Toy Train. Even if they have arrived by bus they cannot fail to notice the little train. Most travellers regard Darjeeling as the gateway to the Himalayas: a romantic approach to a region of mystry and imagination. The grandeur of the spectacular landscapes can be fully appreciated from the vertiginous course of this narrowgauge railway as it labours uphill at about 15 kmph. The line passes through 13 pony-trap stations on its journey. It chugs past the magnificent Himalayan landscape and meanders through breathtaking plains. Running on a two-feet gauge line, it is an engineering marvel as it uses loops and Z-type reversing stations to gain elevation at many places. Passengers hop off-and-on the train or simply lean out to buy the odd ornaments or a cup of tea from Bhutia and Lepcha women who line up their wares on fanciful little stations en route. Although a number of hill railways exist in India, this was the first to be built in the country. The mainline originates from NJP, 120 metres above sea level and runs along the Hill Cart Road for about 18 km upto Sukna. From Sukna, it climbs the foothills reaching an altitude of 2,258 metres at Ghoom, one of the worlds highest railway stations, around 75 km from NJP. From Ghoom it descends for about 6.5 km till it terminates at Darjeeling at an altitude of 2,078 metres, 89 km from NJP. The toy train with its steam engine, apart from being a major crowd puller also plays a vital role in the lives of the local people as it is the only means of transport that has been carting them from the plains to Darjeeling and back for over a century now. The train bears a unique testimony to the cultural tradition of tea plantation, which still remains the main source of livelihood of the populace of the region. 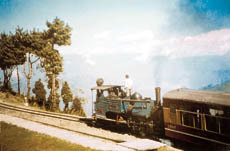 Before the railway started operating in July 1881, the journey to Darjeeling took up to three days from Calcutta. Tea was transported by horse-drawn carts down the winding and tortuous "hillcart" road to Siliguri in the foothills which was the nearest railhead then. The Darjeeling Himalayan Railway was built to improve the commerce and tourism of the area and reduced the time taken to get to Darjeeling by a day. Even before it was declared a heritage property, railway enthusiasts the world over knew about this quaint little train whose engine first came from the Atlas Works in Manchester. Many of them have set up sites on the Internet and aficionados have formed societies for its upkeep. The foremost is the Darjeeling Himalayan Railway Society in London which has been set up to promote awareness and support for this train. It publishes picture postcards which sell in thousands. The proceeds from these go to the Himalayan Railway Heritage Foundation in Darjeeling. It is little wonder then, that the toy train has been enlisted as a World Heritage Site under UNESCOs International Council of Monuments and Sites (ICMS). This will give a new lease of life to the train, known to be the second-oldest in the world railing in high altitude. 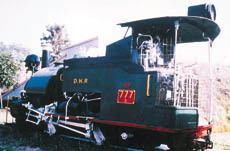 The idea to enlist it as a heritage train was mooted at a workshop organised by various planters associations in Darjeeling in December 1998. The UNESCO meeting in Marakesh on December 1, 1999 cleared the project. The train is now likely to attract tens of thousands of foreign tourists, and will also bring in a number of donor agencies to provide technical and financial support. Recently it drew the attention of the international media when film director Yaavar Abbas came down from USA with his team to capture the journey. Abbass effort is now a part of the Extreme Machines series on the Discovery Channel. Some years ago the National Geographic Magazine also produced a film on the train and noted: "She is the symbol of the railway and evokes the emotional and spiritual ties which the country has for its trains. The men who run stand for the many who have devoted themselves to keeping the lifeline going, and for all those whose lives it touches this will always be the Great Indian Railway."